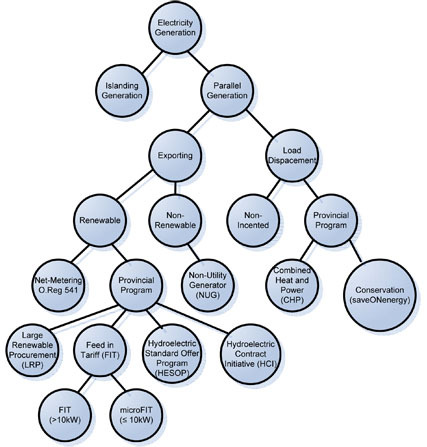 Generating electricity for use by SYNERGY NORTH’s distribution system can take on many forms. Typical generation options available to our customers include ‘islanding’ and ‘parallel’ generation. Also called Stand-by, or off-grid generation, the electricity generated by these systems is electrically isolated from SYNERGY NORTH’s distribution system at all times. Special devices are required to guarantee isolation (required for the safety of equipment and personnel) and are detailed by the Electrical Safety Authority, and within our Conditions of Service. The electricity generated by these systems is electrically connected to SYNERGY NORTH’s distribution system. As these types of projects consume system resources, including; thermal capacity, short circuit capacity, and minimum loads for anti-islanding, proponents of these types of system must apply to SYNERGY NORTH to ensure that capacity for the project is available, and that it is appropriately allocated once approved. Devices to establish guaranteed isolation, to inhibit islanding, to accurately meter electricity, agreements to cover connection costs, as well as operating and maintenance requirements; are some of the many requirements associated with these types of generators. The process for connecting these types of projects is outlined in detail below. Note that the process and requirements vary depending on the size of project. Access Details for Connecting Parallel Generation. Access Details for Capacity of Stations and Feeders.